One of the top China die casting companies operating within the industry today, ChinaSavvy specializes in high quality die casting and manufacturing processes. Our extensive experience within the field covers high pressure aluminum die casting, brass die casting, magnesium and zinc die casting. If your product is in the automotive sector for example, ChinaSavvy will employ a company with extensive experience and training within the specific sector. The alloys chosen will also play a role in the selection of the casting company.Typically working to North American Die Casting Association (NADCA) Standards, we work with a number of China die casting companies, allowing us access to the most suitable companies for your product and requirements. With a tendency of being more expensive to create, aluminum die castings are most commonly found in automobile parts and gears. Also used in handheld devices, heavy-duty electronic connectors and the telecommunications and computing industries, aluminum die castings are not only lightweight, but also able to withstand the highest operating temperatures when compared to the other alloys. A good resistance to corrosion. Aluminum alloys are relatively easy to cast. These alloys have a high electrical and thermal conductivity. A low density and a high dimensional stability. Aluminum die casting requires the use of a cold chamber machine. These alloys have a good strength and stiffness to weight ratio. Fully recyclable, this alloy also has excellent EMI shielding properties as well as a good finishing characteristics. Aluminum alloy 413 has the best pressure tightness and, along with aluminum alloy 383, has the best resistance to hot cracking. 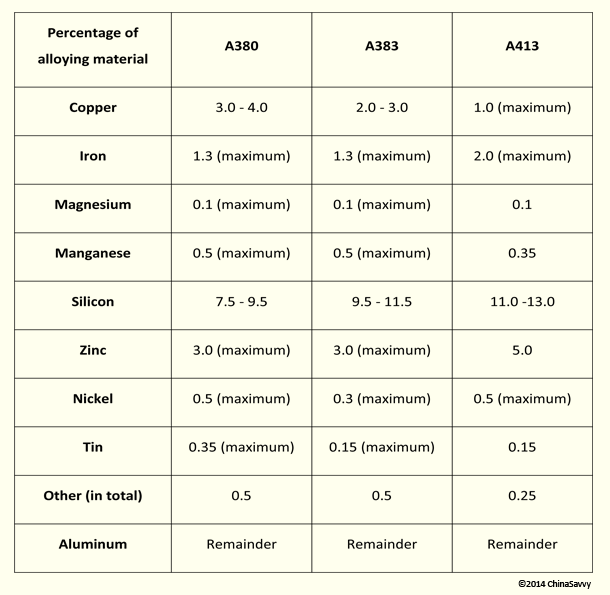 Alloys 380 and 383 has the best electroplating quality and easy, while alloy 383 has the best die filling capacity of the three alloys mentioned in the table above. Almost lighter than plastic, magnesium is a fully recyclable and strong alloy. Used in applications where lightweight and durability is necessary, it is the easiest machinable metal and also the lightest alloy commonly die casted. Suitable for use in both hot and cold chamber machines. 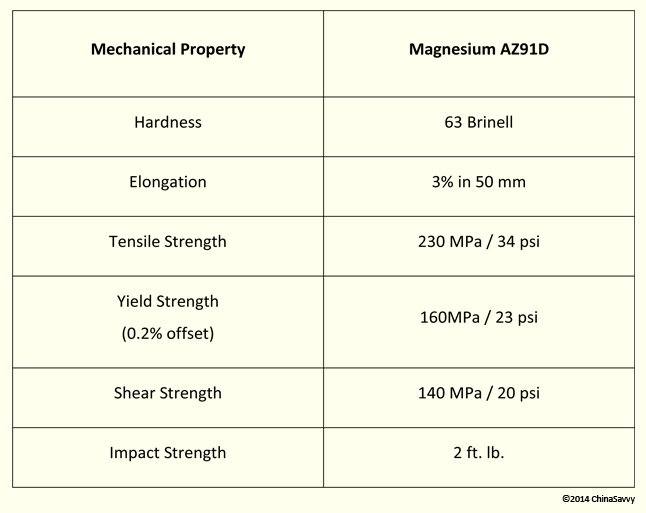 Magnesium offers a high strength to weight ratio. Its EMI and RFI properties are excellent. A high electrical and thermal conductivity. It offers a good resistance to corrosion and is able to withstand high operating temperatures. 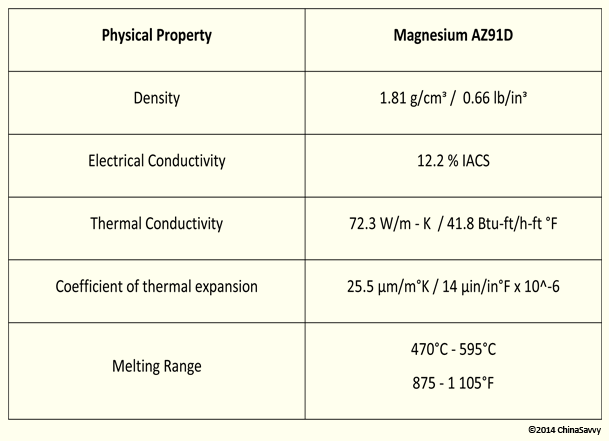 Magnesium alloys have an exceptional thin wall capability, high dimensional accuracy as well as dimensional stability. Magnesium Alloy AZ91D also has an excellent die filling capacity. The easiest alloy to die cast, Zinc die casting offers a better alternative in terms of cost compared to pressed, fabricated, machined and stamped parts. Used in consumer electronics, computing, telecommunications , the automotive industry and net-shaped zinc-housings, this alloys is fully recyclable and also a low-cost raw material. Used in hot chamber machines, castings of zinc boasts with a smooth surface finish, allowing for plating and painting. An ability to form very thin walls. It is easy to casts and offers a good impact strength. Zinc has a low melting point which in turn means a longer die life. 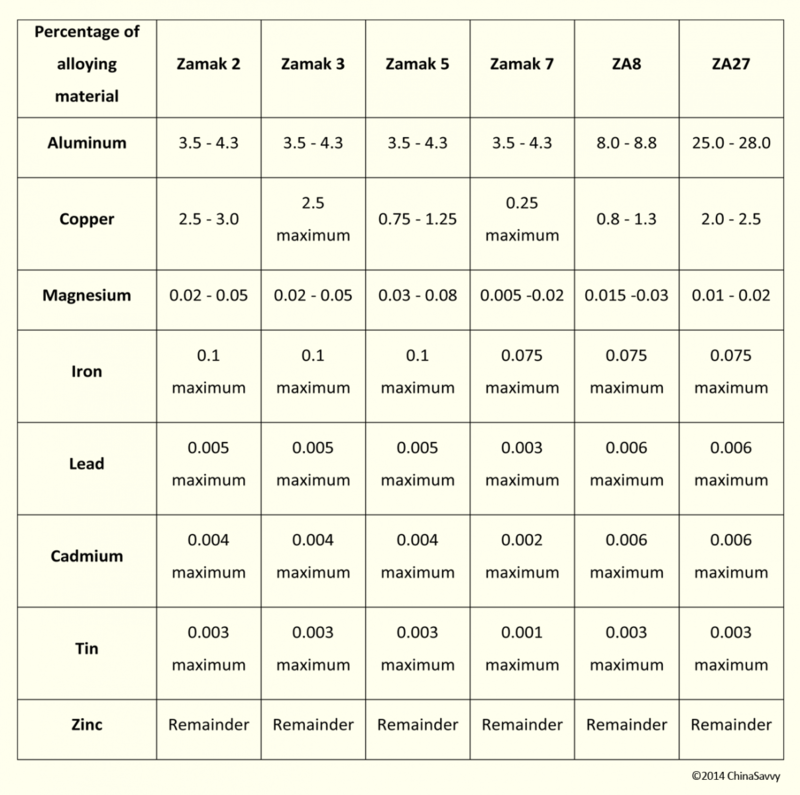 Zinc offers a high dimensional stability and accuracy. An outstanding resistance to corrosion and a high thermal conductivity. Zinc has a high hardness and strength. The ability to cold form aiding fastening and joining. 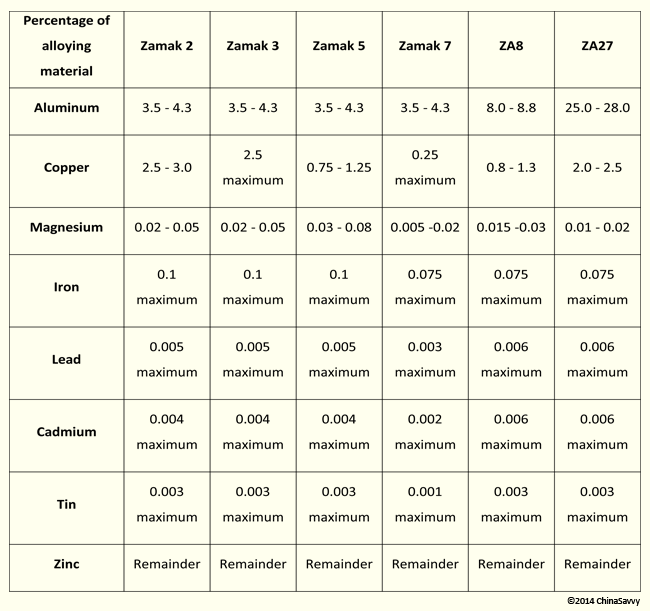 Zamak 2, 3 and 7 offer the best resistance to hot cracking, while Zamak 3 and 7 offer the best pressure tightness. Zamak 2, 3, 5 and 7 are the easiest to cast and offer the best part complexity characteristics. ZA27 has the best resistance to corrosion while Zamak 7 offers the best dimensional stability. It has a high electrical conductivity. It has a fair dimensional accuracy and an excellent resistance to corrosion. It has a medium machining cost and a high die cost. 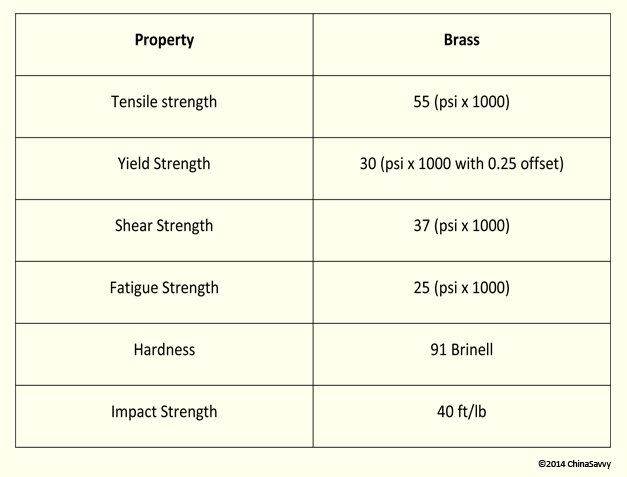 Brass has a low finishing cost. Mechanical finishing such as polishing and buffering. Black chrome plating Lacquers, epoxies, enamels and acrylics. 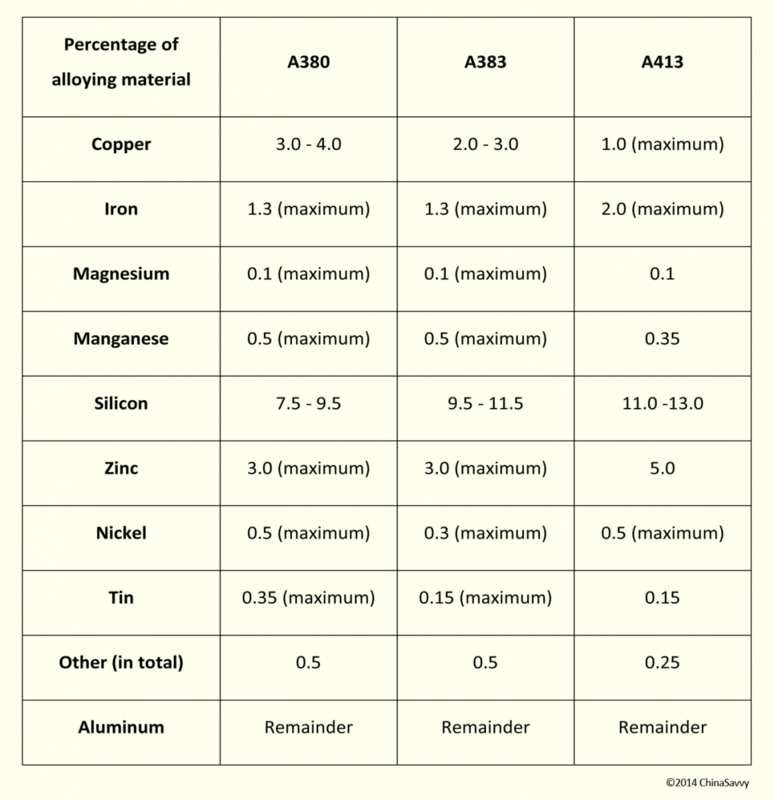 Other alloys that can also be die casted includes copper, lead and tin. These alloys have a high density. Capability to produce parts that have extremely close dimensions. Used in applications where special forms of corrosion resistance is required (such as in the food services industry for public health issues). It is the highest cost alloy to die cast and offers a high dimensional stability. It has a high melting point, resulting in a lower die life. Copper alloys have a high strength. A high resistance to corrosion and wear. These alloys offer the highest mechanical properties compared to the other die casting alloys. Copper alloys require the use of a cold chamber machine. The melting point of the alloy. The strength of the alloy. 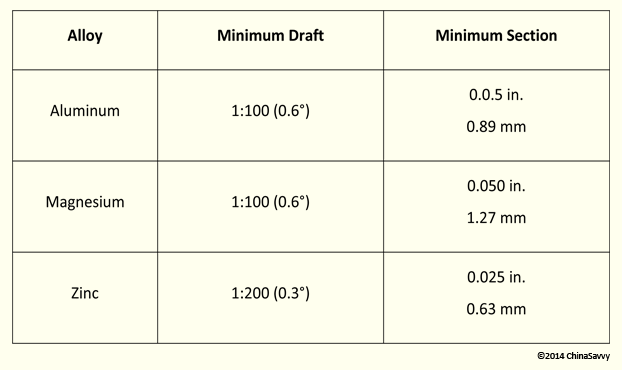 The cost associated with the alloy. The alloy's resistance top corrosion. The selected alloy will also influence the die design, the tooling and the machines employed in the casting process.